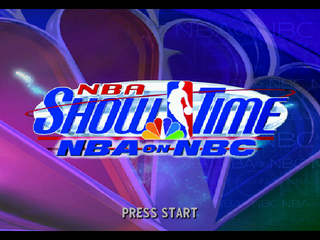 NBA Showtime: NBA on NBC is a 1999 arcade basketball game developed by Midway Games. It was ported to the Sega Dreamcast and released later in the year. It is a sequel to NBA Hang Time. As the name suggests, it is a licensed NBA game tied in with NBA on NBC; the name of US television channel NBC's coverage of the sport. NBA Showtime derives from Midway's previous arcade-style basketball games, consisting of fast-paced 2-on-2 matches with a reduced ruleset. Unlike its predecessor NBA Hang Time, however, the game is presented in 3D, and on the Dreamcast, features a player roster from the 1999/2000 NBA season. Like NBA Hangtime and NBA Jam, the game features a plethora of secret characters. Main article: NBA Showtime: NBA on NBC/Magazine articles.